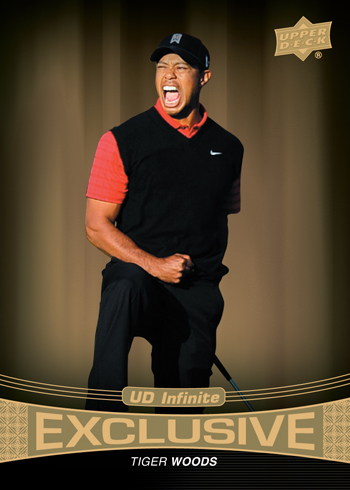 Carlsbad, CA (November 28, 2012) - Upper Deck is celebrating the launch of the company’s new UD Infinite brand with three special cards available to early retailer registrants to the 2013 Industry Summit. Tiger Woods, LeBron James and Robert Griffin III will be featured on these super-premium, extra thick trading cards sequentially numbered to just 150 total copies. These three exclusive cards will be sent to retailers in early 2013 as an advance gift for signing up for the massive trading card conference taking place in Las Vegas at the Orleans Hotel from March 17-20. Only the first 150 retailers to register for the industry's annual trade conference (www.theindustrysummit.com) can receive these special cards. "Upper Deck has been incredibly supportive of The Industry Summit, and this special reward for our first 150 retailer registrants will certainly build momentum for The Summit and the UD Infinite brand,'' Summit host Kevin Isaacson said. "I can't wait to see what happens when these limited cards of Tiger Woods, LeBron James and Robert Griffin III appear in the marketplace." To qualify for the UD Infinite promo pack promotion, hobby retailers can register at www.theindustrysummit.com or by contacting the Summit office at 715-584-4939.